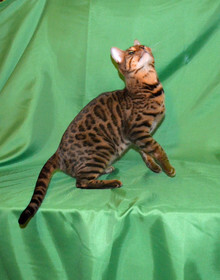 The Bengal is most noted for its luxurious short, soft coat which may appear in either the spotted or marble pattern. Some Bengal's coats feature something called glitter which imparts an iridescent sheen to each hair. The spotted pattern is most associated with the "leopard look" as the coat features clearly discernible spots and rosettes. The Bengal's spots can be large or small and often include rosettes, like the spots of Jaguars and Leopards, which are two- toned spots. Bengals may also be marbled, which is a derivative of the classic or "bull's eye" pattern found in many breeds of cats but with an especially dramatic appearance in Bengals. The marbled Bengal has a swirling pattern that appears as random swirls or thick diagonal and horizontal lines flowing across the coat of the cat. COLORS: Brown Tabby, Seal Sepia Tabby, Seal Mink Tabby, Seal Lynx Point, Black Silver Tabby, Seal Silver Sepia Tabby, Seal Silver Mink Tabby, Seal Silver Lynx Point. Spotted or Marbled Patterns ONLY. Ears: Medium to small, relatively short, with wide base and rounded tops. Set as much on side as top of head, following the contour of the face in the frontal view, and pointing forward in the profile view. Light horizontal furnishings acceptable; but lynx tipping undesirable. face, and on slight bias toward base of ear. Eye color independent of coat color except in the lynx points. The more richness and depth of color the better. Muzzle: Full and broad, with large, prominent whisker pads and high, pronounced cheekbones. Slight muzzle break at the whisker pads. Nose: Large and wide; slightly puffed nose leather. Profile: Curve of the forehead should flow into the bridge of the nose with no break. Bridge of nose extends above the eyes; the line of the bridge extends to the nose tip, making a very slight, to nearly straight, concave curve. Neck: Long, substantial, muscular; in proportion to the head and body. Texture: Dense and luxurious, closelying, unusually soft and silky to the touch. Spotted: Spots shall be random, or aligned horizontally. Rosettes showing two distinct colors or shades, such as paw print shaped, arrowhead shaped, doughnut or half-doughnut shaped or clustered are preferred to single spotting but not required. Contrast with ground color must be extreme, giving distinct pattern and sharp edges. Strong, bold chin strap and mascara marking desirable. Virtually white undersides and belly desirable. Blotchy horizontal shoulder streaks, spotted legs and spotted or rosetted tail are desirable. Belly must be spotted. Brown Tabby: All variations of brown are allowed. Markings various shades of brown to black. Light spectacles encircling the eyes and a virtually white ground color on the whisker pads, chin, chest, belly and inner legs is desirable. Seal Sepia Tabby, Seal Mink Tabby, and Seal Lynx Point Tabby: Pattern can be various shades of brown. There should be very little or no difference between the color of the body (pattern) markings and point color. 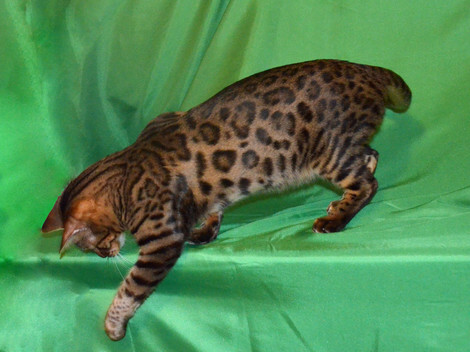 GENERAL DESCRIPTION The goal of the Bengal breeding program is to create a domestic cat which has physical features distinctive to the small forest-dwelling wildcats, and with the loving, dependable temperament of the domestic cat. Keeping this goal in mind, judges shall give special merit to those characteristics in the appearance of the Bengal which are distinct from those found in other domestic cat breeds. A Bengal cat is an athletic animal, alert to its surroundings; a friendly, curious, confident cat with strength, agility, balance and grace. It is a medium to large cat which exhibits a very muscular and solid build. Its wide nose with prominent whisker pads and large oval, almost round eyes in a slightly small head enhance the wild appearance and expressive nocturnal look. Its very slight, to nearly straight, concave profile and relatively short ears with wide base and rounded tips add to the Bengal’s distinctive and unique appearance. The short, dense coat has a uniquely soft and silky feel. The coat may be glittered or not glittered, with neither type to be given preference. A thick, low-set, medium-length tail adds balance to the cat. ALLOWANCES: Smaller size, in balanced proportion, of females. Slightly longer coat in kittens. Jowls in adult males. Eyes slightly almond shaped. Mousy undercoat. Paw pads not consistent with color group description. WITHHOLD ALL AWARDS (WW): Belly not patterned.